ASTM-compliant Breaking Head for Marshall samples. 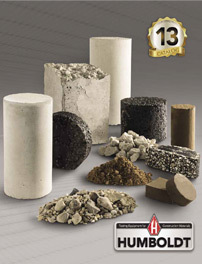 Designed for use with the AASHTO TP124 and ASTM D8044 test methods. Asphalt Tack Bond Shear Strength Apparatus is used in a Marshall Stability Test Load Frame. Used to measure flow during Marshall testing. Consists of a special dial indicator with a maximum position brake assembly. Guide sleeve for use with dial gauge to measure flow during Marshall testing.